A year-end market rally and the second Federal Reserve interest rate hike in a decade served to slightly dampen affluent investor enthusiasm in December. The Spectrem Affluent Investor Confidence Index (SAICI®) and the Spectrem Millionaire Investor Confidence Index (SMICI®) each posted slight decreases in last month. The SAICI ticked downward three points from the previous month to 5, while the SMICI decreased two points to 12. Both indices stood one point higher than in December 2015. Since 2004, the monthly Spectrem Affluent Investor Confidence Indices have tracked changes in investment sentiment among the 16.3MM households in America with more than $500,000 of investable assets (SAICI), and those with $1MM or more (SMICI). This month’s survey was fielded between December 14-19, 2016. 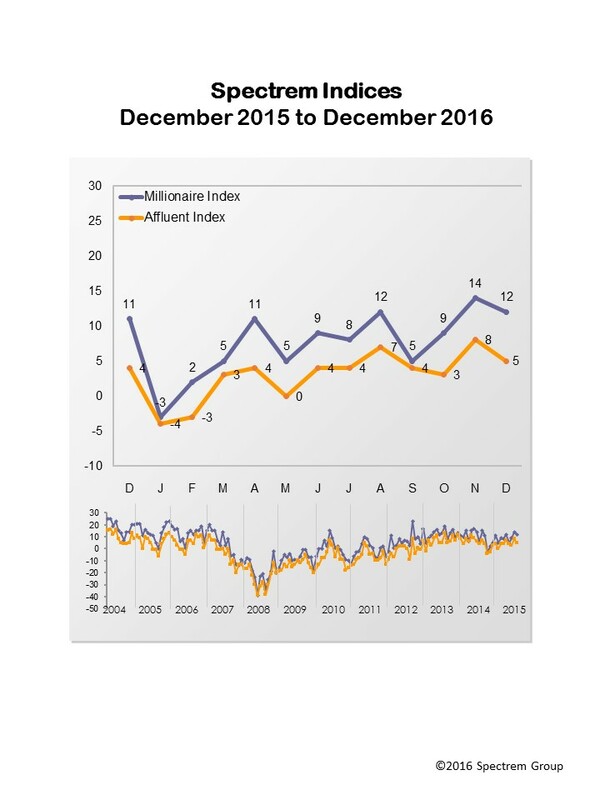 For the second consecutive month, political affiliation was a significant factor in gauging Affluent investor confidence. Prior to the election, the SAICI and the SMICI for Affluent investors who identified as Democrats was higher than it was for those who affiliate as Republicans and Independents. This has flipped since the Nov. 8 election. The December SAICI for Democrats is at -10, a drop of 13 since November. For Republicans it is at 9 (a dip of 3 pts. from the previous month and for Independents, 15 (a gain of 3 pts.). Similarly, the December SMICI for Democrats is at -4, a drop of 7 pts. from November. In comparison, the SMICI for Independents is 25 (a gain of 7 pts. from the previous month and at 14 for investors who affiliate with the Republican party (a loss of 7 pts. from November). There is also an investor confidence gap between males and females. The December SAICI for men is at 10, a dip of 2 pts. from November and at -6 for females, a drop of 6 pts. The SMICI for males is at 16, unchanged from November. It is at -3 for females, a decline of 6 pts. While the indices ticked downward, the Spectrem Affluent Household Outlook, a monthly measure of four financial factors that impact investors’ daily financial lives, surged to a 19-month high in December driven by Millionaires’ increased long-term confidence in the economy. The December Spectrem Affluent Household Outlook is at 27.30 pts., a gain of almost five from November and up 12 pts. from December 2015. Overall, confidence in the economy is at 17.60 pts., a gain of 7.60 pts. from November and up 22.40 pts. from December 2015. For Millionaire investors, confidence in the economy is at 26.56 pts. For non-Millionaires, it is at 8.20 pts. Millionaires, too, reported higher long-term confidence than non-Millionaires in household assets, household income and company health. Again, Affluent investors who identify as Republicans are on a confidence roll. For the second consecutive month, they posted a higher Spectrem Affluent Household Outlook than investors who are affiliated with Democrats and Independents (35.06 vs. 6.94 and 34.37, respectively). Confidence in the economy is at 54.02 pts. for Republicans, 17.50 for Independents and -30.56 for those investors who identify as Democrats.